Shaw Lifeguard Waterproof Carpets Now on Sale - Save 30-60%! Explore Shaw Lifeguard Waterproof Carpet styles! Order Shaw Lifeguard Carpets Today and Save! Carpet made with LifeGuard® waterproof backing is engineered for life's little messes, keeping 100% of all spills, splatters, and accidents contained for complete clean-up protection. Experience the science of waterproof carpet, an incredibly comfortable carpet that is perfect for the active family with children and pets. A carpet that does not allow liquids to penetrate through to the underlying padding! This allows messes and accidents to be easily and effectively cleaned down deep. Keeping a clean and stress-free home is the key to keeping a healthy home, and Shaw Lifeguard Waterproof Carpets are leading the way in providing that tremendous feeling for your carpets for years to come! Lifeguard Waterproof Carpet has the Patterns, color, and Quality that you're looking for to bring a unique look to your space. 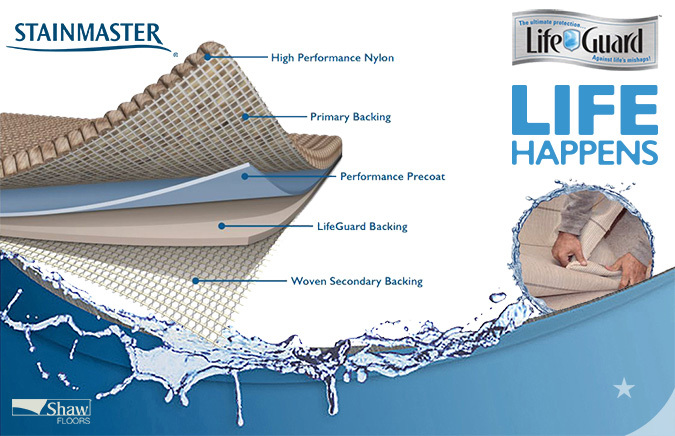 The best deals on Lifeguard Waterproof Carpets can only be found at American Carpet Wholesalers. Buy Shaw Lifeguard Waterproof Carpet Today at ACWG!